I had 1lb of pork belly in the freezer and I had no idea what to do with it. So I hit up my foodie bestie, Kwok Mun, and one of his braising suggestions kind of hit a home run. Well, it didn’t help that I had Diners, Drive-ins and Dives playing on the TV as well. It was decided that the pork belly will be braised. Overnight. Yep, you heard me alright. I braised my pork belly overnight in my oven for over 8 hours in a slow and nice heat – 240F to be exact (approx. 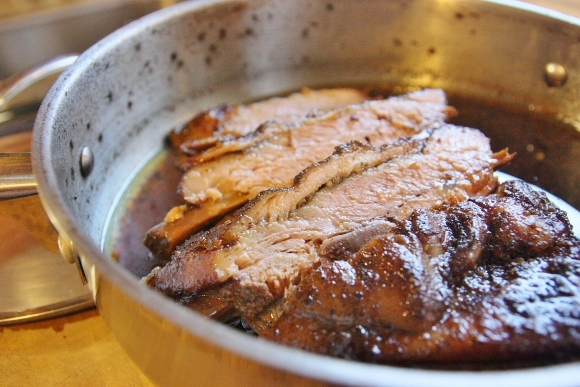 120 C) – in a fragrant pool of dark liquid made up of similar ingredients to my other braised pork dish. The end result was delicious. Meat falling off the bones scandalously with an oh-so-tender, melt-in-your-mouth goodness. You will want this recipe. Cut 80% of the fats off the skin of the pork belly to get rid of the tough skin layer and most of the fats. Make incisions into the skin of the pork belly’s fat side. Don’t cut all the way through but about 1/4 way through so you can rub the spices in. Take your spice rub and massage your pork belly with your hands, make sure to insert every bit of that spice rub into the incision cuts. Set aside. In a large enough heavy steel pot (or a deep baking tray cover with aluminium foil if you don’t have one that’s big enough), add 1 tbsp of oil and heat it on the stove. You want to sear the pork belly first so that it is browned on both sides. I do this to also toast the spice rub around it for more smokiness. Add water, soy sauce, cooking wine, brown sugar, star anise, cinnamon and garlic in and let it come to a simmer. Reduce oven heat to 250F. 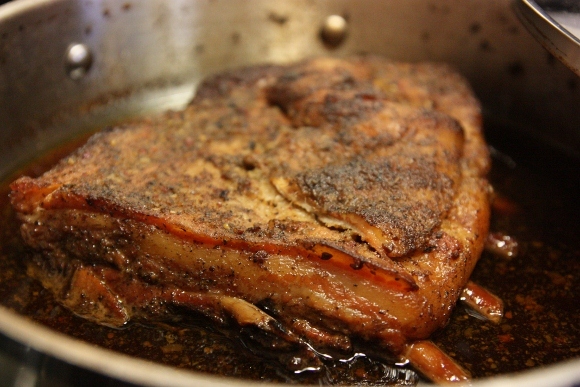 When the pork belly starts to come to a simmer, turn off your stove and pop the pot with the cover on into the oven. 8 hours later, you will be awakened by the aroma of something magically delicious brewing in your kitchen. Your overnight slow braised pork belly is ready and the meat should fall off the bone easily but still hold its shape. How you eat this is entirely up to you but I personally like reducing the jus until it thickens and then pour it over a pulled apart pork belly before serving it with some sesame buns. And a cup of green tea, that’s what I call breakfast. Or brunch. Or supper. I am going to have leftovers for a week. Oh my gosh! 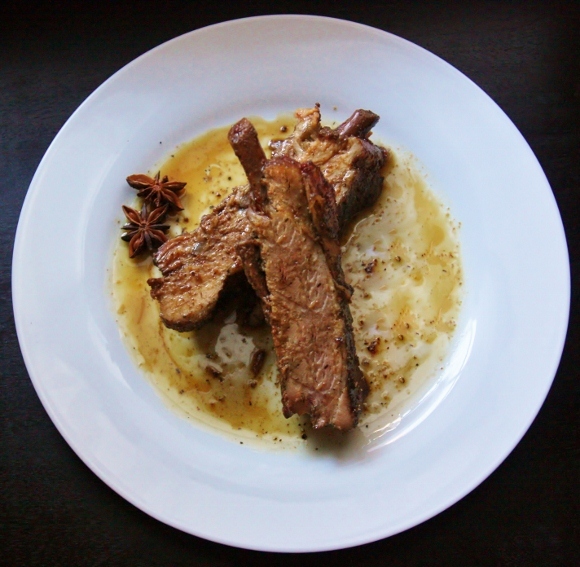 This is such a amazing pork dish! And it is so versatile…eat it with man tou, white rice..and looking at the potentially good amount of jus, a reduction of it will definitely goes well tossed with angel hair pasta. Can’t wait to try this soon.